How Do I Stop Websites from Pestering Me About Notifications? - Ask Leo! It seems many websites now really, really want to keep you as informed and as up to date as possible by providing notifications in your web browser when something they think is important happens. As on mobile devices, all these websites seem to act as if they were the MOST IMPORTANT WEBSITE EVER, and if it were up to them, you’d be faced with a never-ending stream of notifications. There’s a simple setting buried in Google Chrome. There’s a simple setting buried in Firefox. Internet Explorer doesn’t need a setting change since it doesn’t support notifications. Edge supports notifications, but there doesn’t appear to be a way to turn them off. 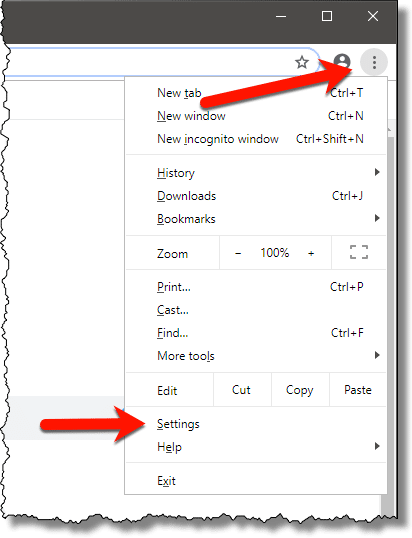 Click on the triple-dot admin icon on the far right of the Google Chrome menu bar, and then click on Settings in the resulting menu. On the resulting page, scroll to the bottom, click on Advanced (not shown), scroll down some more, and click on Content settings. Scroll down on the resulting page and click on Notifications. Finally, on the resulting page, click on Ask before sending. This will change the entry to read Blocked. 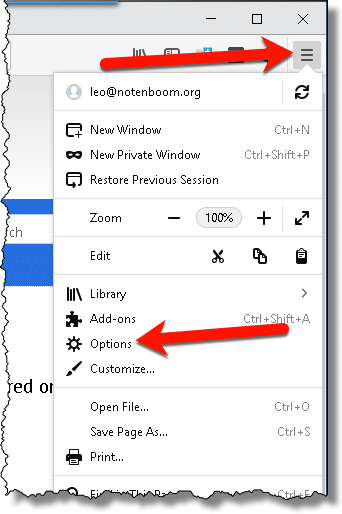 Click on the “hamburger” menu on the far right of the Firefox menu bar, and then click on Options. On the left-hand side of the resulting page, click on Privacy and Security, then scroll down until you find Notifications, and click on the Settings button to its right. In the resulting dialog box, make sure “Block new requests ” is checked, and click on Save. From what I’ve been able to determine, Internet Explorer doesn’t appear to suffer from this issue because it doesn’t include support for push notifications. I’ve stumbled on an add-in or two that adds the functionality, but if you want to avoid these annoyances, just don’t install the add-in (or remove it). Edge does support push notifications. Unfortunately, Edge is also light on settings and customizations. I’ve not found a way to turn off notifications aside from declining each one, as shown above. « Previous post: Someone’s Sending from My Email Address! How Do I Stop Them?! There is a workaround for the Edge browser: Don’t use it 🙂 . Seriously, does anyone use Edge? i have them turned off in extensions and i did not add them to allowed. enforced by an extension”. i have two extensions, an adblocker and https everywhere. are one of them causing this to be allowed? Unlikely. It’s more likely that Google Chrome is simply allowing it because it’s from Google as well. Yeah, it is…was an offer. I already receive it, so all I had to do was click on the big X on the left hand top corner. It’s sure NOT as annoying as those dang pop-ups, that I have now fixed, thanks to Leo! And if you don’t clear cookies, you will only get that pop-up once a month. Another reason cookies are useful. You are right on concerning the “Google” work-around. I do get (very few) notification request after I used your suggestions, Thank you! I do not have Content Settings listing under Advanced in Chrome. Can they be accessed in a different way? Are you using the latest version of Chrome? Another option with Chrome is to click on the pic of the lock just to the left of the site address in the upper address bar. 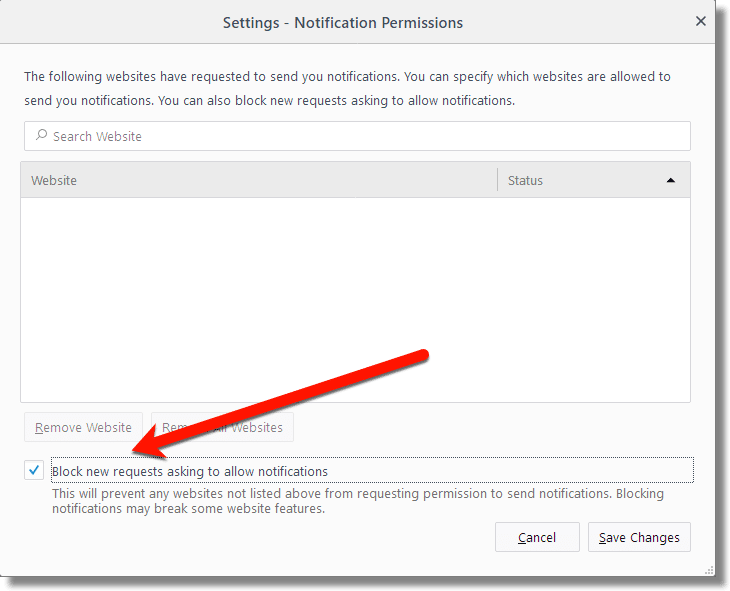 Select “site settings” in the box which pops-up and then block notifications as Leo instructed. You can regulate all sorts of things–sound, images, automatic downloads, flash, etc– from any single website very easily using that method. I like to use it to block sound from sites (like CNN) which automatically play videos when you visit the page. If there’s a video I want to listen to, it takes only a few seconds to temporarily unblock the sound. That’s very useful information, but this article is about blocking notification requests globally so websites don’t even ask. Many thanks for your help! Notifications now blocked in Google Chrome! Hope you are soon fully recovered from that nasty virus! I’m very grateful for your tip on how to stop those effin’ notifications, Leo. It was getting to the point where I was going to resort to a Google search for help but I didn’t really know what keywords to use. Thanks. Thank You,this is really Helpfull. I’m not sure how that solves anything. The sites you then go to are the ones that are requesting the ability to notify you. Generally I have the notification thing covered on my android tablet, but recently began using a website where its important not to have notifications blocked. One of our country’s bush fire alert systems relys on the notification box method in their website design to provide the vital information about each fire. I tap on a fire icon on the chart and a dialogue box appears with basic info. I can tap in that box to go deeper into the info or X out. The developers of the site must have good reason to use this protocol but they obviously also know that so many people have pop-ups, ads and notifications blocked, they’ve made a little dialogue box come up over the chart telling the user to allow notifications so they can read the vital info. Yeah, I’d question their choice. If it’s that important I’d consider alternative notification methods including, but not limited to, letting people sign up for email or SMS notifications.